The Capital Wine School is excited to bring the WSET Level 2 course to Norfolk, Virginia! Please join sommelier and owner of the Crystal Palate Wine & Gourmet, Crystal Cameron-Schaad, who will teach this WSET course. Space is limited, so be sure to register early. 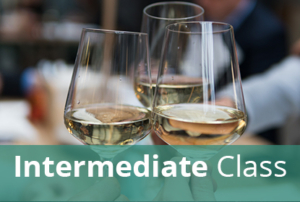 This 5-class course will be held at Crystal Palate Wine & Gourmet on the following dates: March 12, March 19, March 26, April 2, April 9, with the exam on April 23. Each class meets from 6:00 p.m. until 9:00 p.m. The exam also begins at 6:00 p.m.
For detailed information about the WSET Level 2 Award in Wine & Spirits, please click here to download a PDF of the WSET’s Specification. The aim of the course is to focus on the key grape varieties and regions of the world, as well as principal varieties of spirits. While the course provides an overview of the wines and spirits of the world, including main wine grapes and regions, it also covers factors affecting wine quality and style, grape growing, and basic winemaking practices. The course emphasizes tasting assessment and the skills required to describe the aromas and tastes of wine. It helps to develop fundamental tasting and assessment skills. During each session of the class, students taste 8-9 wines. The exam takes 1 hour and consists of 50 multiple choice questions. Those who pass the exam receive the WSET Level 2 Award in Wines and Spirits, an internationally recognized credential in the wine industry. The course fee includes the 5 classes at Crystal Palate Wine & Gourmet; PDF copies of the class lectures; the WSET course book, study guide, and guide to the systematic approach to tasting wine; practice quizzes; 40 different wines; and the exam at Crystal Palate Wine & Gourmet. Note: This is a structured educational class with seated tastings and classroom style lectures.